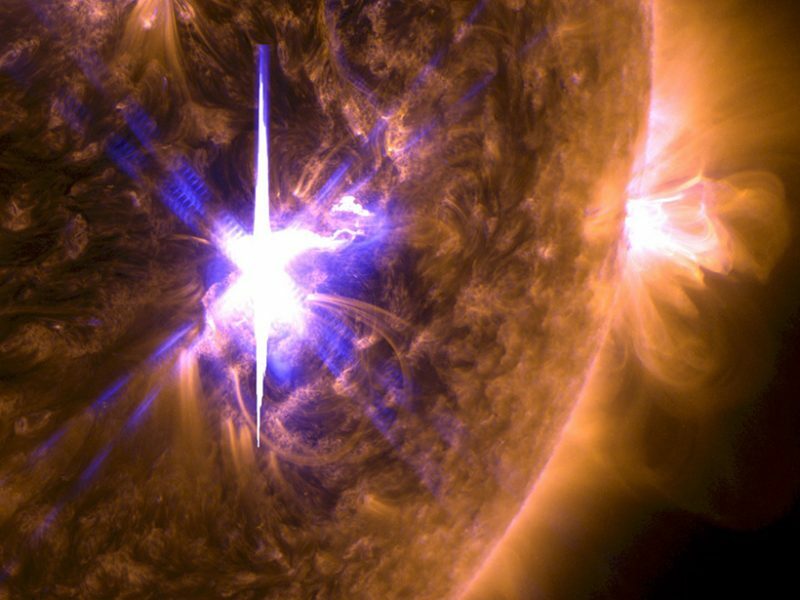 A flare erupting from the surface of the Sun on Wednesday blocked communications and interfered with navigational frequencies across the globe. Large portions Europe, Africa, Asia, and Australia experienced disruptions to low-frequency radio communications, according to the U.S. National Oceanic and Atmospheric Administration (NOAA). As the flare jetted outward from the Sun’s surface, the star’s outer atmosphere, or corona, belched a huge cloud of ultrahot, electrically charged particles, known as a coronal mass ejection (CME) toward Earth. The CME prompted a warning from NOAA solar storm watchers of an impending strong (G3) geomagnetic storm or greater through today. An updated NOAA report at 1:57 p.m. Coordinated Universal Time (UTC) today revised the agency’s assessment to “G4 (Severe) geomagnetic storm levels” for the day-lit side of Earth. In addition to roiling communications and navigation signals, such geomagnetic storms can create surges or shutdowns in power grids and produce brilliant auroras visible at lower latitudes than usual. According to NOAA’s Space Weather Prediction Center, the flare sprung from the Sun at 12:02 p.m. UTC on 6 September, accompanied by the CME, which arrived at Earth late last night and is expected to persist through today. NOAA heliophysicists identified Wednesday’s flare as the largest solar flare to date in the current solar cycle, which is an approximately 11-year cycle that tracks when solar activity increases and decreases. The current solar cycle began in December 2011. Although the Sun’s activity is declining on average, large flares such as these are not uncommon during this stage of the cycle. Heliophysicists associated with NASA’s Solar Dynamics Observatory (SDO) classified this event as an X9.3 solar flare, meaning it’s in the most intense class of flares. What’s more, the same region of the Sun had produced another X-class flare about 3 hours earlier on the morning of 6 September. Three other moderate-intensity flares have exploded from the region since 4 September, in addition to flares from other active areas on the Sun’s surface. “It’s the active region that keeps on giving!” tweeted Sophie Murray, a space weather scientist at Trinity College in Dublin, Ireland. NOAA’s Space Weather Prediction Center also reported a strong (R3) radio blackout on Wednesday at 9:10 a.m. UTC due to both flares that day.